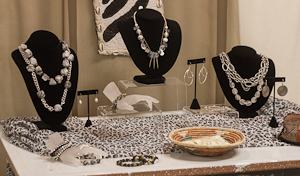 Use acrylic risers as an inexpensive way to create height levels in your jewelry displays! Ever wonder why when you’re at a an art or craft show, some booths have people crowded around them, while others are virtually empty? Or, more specifically, how to get people to notice your booth and then stay long enough to purchase something? There are a couple of key things you need to accomplish overall, and then we’ll go into three specific ways you can increase your sales. These key things are the following: you need to catch people’s attention, keep them interested, and make what you have so valuable to them that they can’t live without it. How do you make this happen? Let’s start from the outside of the booth and work our way inside. 1. An attractive booth. This is how you catch their attention. If you have a booth that is pleasing to the eye with carefully-selected, appropriate decor and signs, people will be more likely to both notice you and stop by to look. Use attractive fabrics, a clean tent, stylish signs, etc, to initially capture people’s interest. If the outside of your booth is attractive, they’ll want to stop by and see what’s inside. 2. Your product. This the first half of how you keep them interested (and part of how you give your product value). This needs to be displayed and presented in such a fashion that they are drawn in and want to keep looking. Do you have everything flat on a table so that it’s boring for people to see and hard to distinguish between items? Or do you utilize varied height levels, appropriate displays, and lighting? Clearly price your items and have signs pointing to things of interest. This helps people to know where to look. 3. You! This is the other half of keeping their interest and making your product valuable to others. Your body language and how you act when people enter your booth make a huge difference in how comfortable people will feel when browsing, and help to determine whether or not they’ll feel like browsing. If you’re sitting in a corner reading a book and ignoring the people who stop by, or greet them with a mouth full of food, they aren’t going to feel welcome. However, if you greet them with a smile and engage them in conversation, they’ll feel more at ease and therefore be more likely to make a purchase. Talk about the weather, share your creative process with them, show them one or two of your favorite pieces and ask them what they like or dislike (and then you’ll be able to guide them toward things that they will love!). Engaging people and showing them that you’re not only passionate about your work but that you care about them will give your pieces value in their minds and turn those potential customers into actual customers! What are some tried-and-true ways of attracting people’s interest that have worked for you?